We use PayPal to safely process your credit card orders. Prefer to pay by check? Right Click here to download and print our order form. The original Maher Course of Ventriloquism was updated & expanded by Clinton Detweiler. The course was published as 30 small booklets. Two tests were included, which had to be completed for students to graduate. The course was considered the gold standard in the vent community. Today, the lessons have been transcribed and released as 30 Kindle books. This way, the course can be taken at your own pace as finances allow. Don’t have a Kindle? Amazon offers free apps so you can read the lessons on your computer, tablet or smart phone. We now offer the tests online and graduates receive certificates by PDF. In 2012, I created the first online virtual ventriloquism course. The time released lessons give students a chance to practice before moving on. Those exercises help build a solid foundation for the skill. Today, the Learn Ventriloquism course is one of the most respected in the art. With a total of 36 lessons and 2 bonus articles, it teaches material that no other ventriloquism course offers. Maher Ventriloquist Studios is thrilled to bring back one of our old products! The CD is no longer in production, so we have converted the audio to create MP3 files. Now you can instantly download, listen and learn from one of yesterday’s master ventriloquists! The Bob Neller audio instruction Course on Ventriloquism is still regarded as one of the best. Prepared after more than 40 years of professional performances. Hear Bob explain clearly and precisely how to produce the proper ventriloquist voice with perfect diction. And Neller’s technique and instruction on Distant Voice Production and presentation is not only unique, but truly amazing. For the novice or Professional. Laugh and learn with two of the top comedy guys in the field of ventriloquism. This audio is like having a conversation with them in your own living room. Discover some of the comedy secrets used by these two successful performers. Originally released on CDs at their Vent Haven ConVENTion lecture, Maher Studios has converted the original recordings to MP3’s for you to download. You’ll listen to these again and again! Challenge yourself ventriloquially! Lip Service is the first audio practice session of its kind. Starting with breathing warm ups, you will be challenged with difficult letters, words and groupings. Have fun with original tongue twisters and even learn some poems that may make their way into your act. 10 challenging tracks to help keep your vent skills sharp. Listen while driving, exercising or anytime you want to laugh and have some fun. Mark Wade, “America’s Foremost Children’s Ventriloquist”, shares some of his secrets and insights into the world of comedy for kids. In this audio book you’ll learn the “Kidshow Joke Formula”, joke construction, many different “spins” that will help you find the funny … and much more! If you work kid shows, this is a must have audio book. Any variety entertainer that performs for children will benefit from Mark’s insights and 35 plus years of experience. The concept was based on Mark & Ken’s popular Comedy Conversations available above. You will laugh and learn with this fun informative audio. Written by a long time friend of Maher Studios, Dale Brown has published a goldmine of information at a price anyone can afford. Take your vent act to the next level in terms of comedy dialogs, customizing your show and business/marketing tactics. “Putting Money Where Your Mouth Is” provides step-by-step information for aspiring ventriloquists on how to take their careers to the next level by writing better scripts, improving performance, promoting on a higher level, and succeeding as professional entertainers. A classic book by one of America’s leading children’s entertainers, Mark Wade teaches everything from ventriloquism technique to complete comedy routines for kid shows. His years as a full-time performer give him the credibility to write with authority on how to get the best reaction from children’s audiences. This eBook is available on my web site: Cruise-Ship-Entertainers.com and through Amazon.com. How To Vent Your Expressions is the complete guide to portraying Emotions, Expressions and Actions! Bring your ventriloquist figure (or stage puppet) to LIFE by using this amazing reference book to learn how to manipulate your puppet or figure in the most life like manner. “Advanced Ventriloquism” is the next step enabling you to become a polished, knowledgable performer! Build upon your basic skills. Become a master performer. Laugh as you learn! Mark will show you the secrets that will make you a notch above the average ventriloquist. Learn about: showmanship, puppet character development and ventriloquist specialties. Your shows for kids can have greater impact, fun and marketability! Using dynamic in-studio instruction coupled with live performance examples from actual shows, America’s Premier Ventriloquist For Children, Mark Wade, will show you how on this entertaining and educational two part video. Mark Wade is known for his famous Baby Cry routine. He has taught the technique in earlier videos and during lectures at the Vent Haven International Ventriloquist ConVENTion. Mark Wade and Tom Crowl teamed up to present a very detailed workshop at the Vent Haven International Ventriloquist ConVENTion. The workshop was recorded and is finally available, only here at Maher Studios. One of the biggest problems for many ventriloquists is creating a unique voice for their characters. This ten lesson online course helps make creating puppet voices easier! This Show Biz Thing Is NOT Easy… Can YOU really earn a living in show business? Could YOU be a successful entertainer? How do you get started? Who do you contact? How do you get shows? How much should you charge? WHAT DO YOU NEED TO KNOW? Ken Groves’ Creating A Character has been turned into an online course! Many people look for a funny puppet, but the puppet has nothing to do with your success. A ventriloquist needs a strong character. Your Material Has To Entertain And Give An Audience A Reason To Watch. This Master Class course consists of interviews with five professional ventriloquists: Mark Wade, Ken Groves, Steve Petra, Sarah Jones and the late Bill DeMar. Each was asked questions about their script writing process. Their answers will provide you with a unique look into the minds of these performers. There are thousands of entertainers. Most of them are stuck working “real” jobs to make ends meet. Yet Jeff Dunham is the highest grossing touring comedian according to Forbes magazine. Some people think these artists got a lucky break. Is that really the only reason you haven’t achieved success as an entertainer? Sculpt a ventriloquist dummy head out of clay, create molds, cast the head and check quality, cut out and build a moving mouth, explain exactly how the mouth pivot point is determined, build self-centering, moving eyes and provide a step-by-step demonstration of how to install the mechanics. We’ve segmented Mike’s full course into bite sized chunks that can help save your budget! Get each module as finances and progression permit! Wish you had the skills to give your figure a make-over? Now you can learn from a pro. In this module, taken directly from Mike Palma’s Build Your Own Ventriloquist Figure, you will receive 5 video lessons of instruction. Learn: How to prepare your figure for painting, the different paints figure builders use, applying a proper base coat, adding color and blush, and how to finish and protect the paint job. 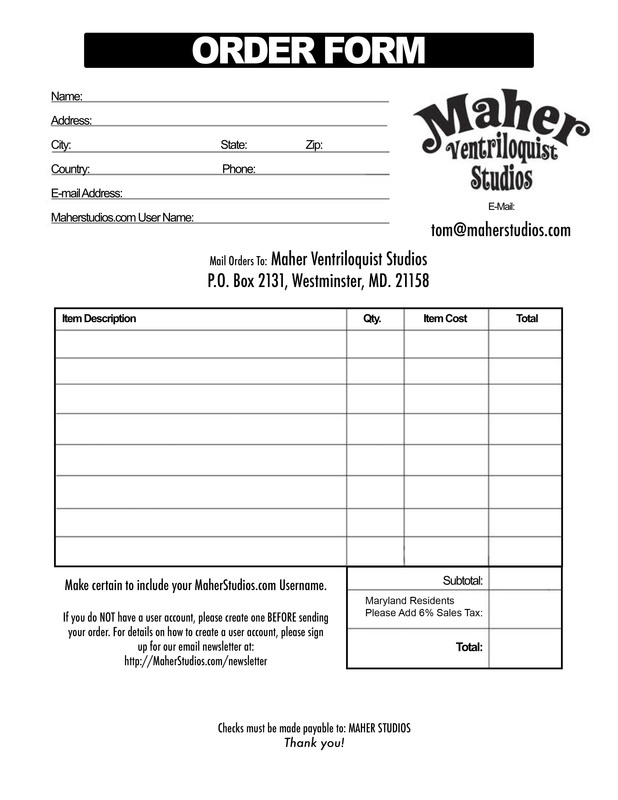 Maher Studios no longer makes, sells or repairs ventriloquist figures. If you need advice concerning this topic, feel free to email and I will be happy to direct you to a figure maker that can help you.